Photograph of the Shwe Zigon Pagoda at Pagan (Bagan), Burma (Myanmar) taken by an unknown photographer in the 1870s. It is one of more than two thousand religious monuments built by kings, nobles and monks as meritorious acts on the plain at Pagan on the eastern bank of the Irrawaddy (Ayeyarwady) River in central Burma. The earliest structure dates from the late 9th century but most date from Pagan’s golden era, between the 11th and the 13th centuries when it was a royal city and the capital of an extensive Burmese kingdom. The Shwe Zigon lies to the north of Pagan at Nyaung U, the main settlement on the Pagan plain, and is the main centre of pilgrimage at Pagan because it is believed to contain significant relics of the Buddha. Its construction is attributed to two kings noted for their patronage of Buddhism. Anawrahta (ruled 1044-1077), converted to Theravada Buddhism by monks from Thaton, is reputed to have begun the building of the pagoda. It became the greatest temple of his reign, during which Theravada Buddhism was established as the Burmese state religion. It was finished by his son Kyansittha (ruled 1084-1113). The graceful bell-shaped stupa is important architecturally because it became the prototype for many later Burmese stupas. In the foreground of this view are two colossal chinthes or leogryphs, temple guardian figures. 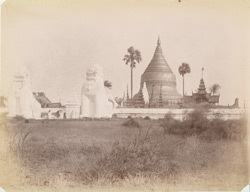 The photograph is one of a series of images in the Temple Collection documenting Burmese pagodas which were taken from a set of slides used by Sir Richard Carnac Temple to illustrate a lecture on 'Developments in Buddhist Architecture'.